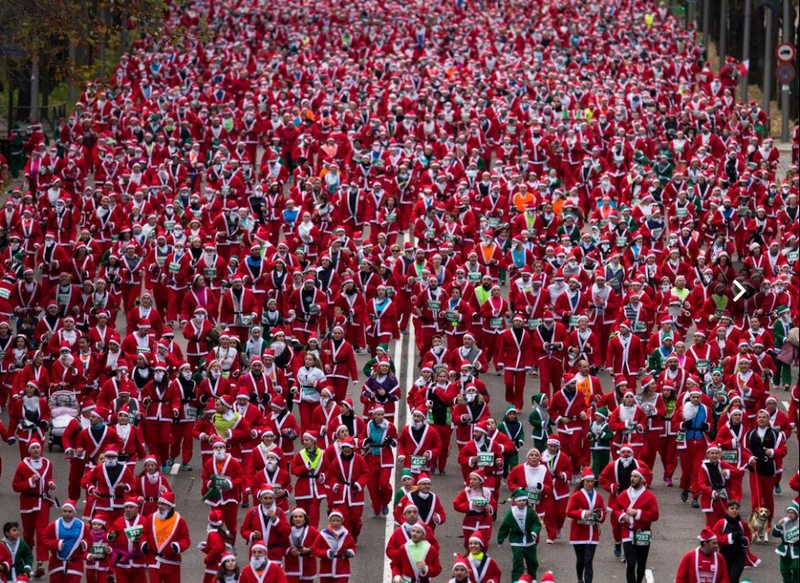 Thousands of running Santas crowd through one of Madrid’s main boulevards on Saturday (December 17) as they take part in a six kilometre race in which amusement and Christmas where the main ingredients. Clad in the traditional red jacket and hat the participants set off from Colon square and ran to Real Madrid’s Santiago Bernabeu and back in a race where organizers aimed to gather the biggest number of runners dressed in Santa Claus outfits. More than 10,000 runners took part in the race, paying 15 euros each. Organizers provided the runners with a Father Christmas outfit, including the beard. Kids ran in green elves outfits.